International guest engagements lately brought Roman Ialcic as TOMSKY in ‚Pique Dame’ to the Grange Opera Festival in England, as BASILIO in ‚I Barbiere di Siviglia’ to the Scottish Opera Glasgow, as CASPAR in ‘Der Freischütz’ to the theatres of Toulon, St. Etienne and the Lyric Opera London, as 1st SOLDIER in ‘Salome’ to the theatres of Bolzano, Piazenca and Modena. He portrayed DON PROFONDO in ‚Il Viaggio a Reims’ at the Teatro Real Madrid and WARLAAM in ‘Boris Godunov’ at the theatres of Klagenfurt and Münster. Roman Ialcic began his musical studies (conducting and singing) at the Conservatory in Minsk. He completed his studies at the Conservatory of Chisinau (Moldavia). In 1996, he began his career as soloist at the Chisinau opera studio. With a governmental scholarship, he was able to study 1999 at the Richard Strauss Conservatory in Munich with Nikolaus Hillebrand. During this time he sang his first SARASTRO in ‚Die Zauberflöte’ at the Open Air Festival in Isny. From 2001 to 2005, the young singer was a member of the Stuttgart State Opera ensemble, where he could be seen in numerous small roles such as BABUROW in Schostakowitsch’s ‘Moscow Tscherjomushki’. From 2007 to 2009, Roman Ialcic was engaged as a soloist singer at the St. Gallen Theatre. Here he sang parts like ABIMELECH in ‚Samson et Dalila’, den TOMSKY, ESCAMILLO, CASPAR, PRIEST In Sutermeister’s ‘Black Spider`,…. Just to name a few. The artist performed as a concert soloist in Verdi’s Requiem, Dvorak’s Stabat Mater, etc. with the Chisinau Philharmonic Orchestra, the Stuttgart Philharmonics, the Orchestra of the Teatro Villareal Jerez and the Orquesta Sinfonica y Coro de RTVE in Madrid. Ermanno Wolf-Ferrari’s I QUATRO RUSTEGHI he performed in 2012 under the musical direction of Vasily Petrenko with the Royal Liverpool Philharmonic Orchestra. In the season 2013 /14 he was cover for Speight Jenkins as FAFNER in ‚Das Rheingold’ andHUNDING in ‘Die Walküre’ at the Seattle Opera and made his debut as ABIMELECH in ‘Samson et Dalila’ at the Cologne Opera House. In the season 14/15 h portrays BASILIO in ’Il Barbiere di Siviglia’ at the Opera House in Oviedo and the Wupperta Theatrel, ZACCARIA in ‘Nabucco’ in performances in Switzerland and France and TOMSKY in the new production PIQUE DAME at the Opéra National du Rhin Strasbourg. In the season 15/16 he debutes as LUDOVICO in ‘Otello’ at th Teatre Liceu Barcelona. Other admirable performances include … and especially Roman Ialcic as Tomsky. 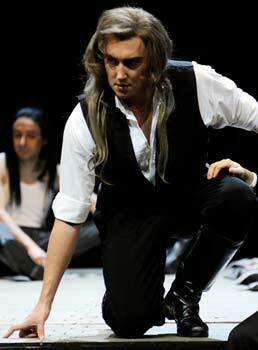 Roman Ialcic impressed me as Tomsky; he has a lively sense of vocal attack and projects his phrases well. Roman Ialcic, a super-confident Tomsky. Roman Ialcic made a lively Tomsky. and Roman Ialcic’s bracing Count Tomsky. Lead voice and leading actor among them is Tomsky, both vocally and dramaticly imposingly performed by Roman Ialcic, right from the beginning unto the biting offences in the final act. Ialcic’ Caspar was was excellent, both vocal and gramaticly.